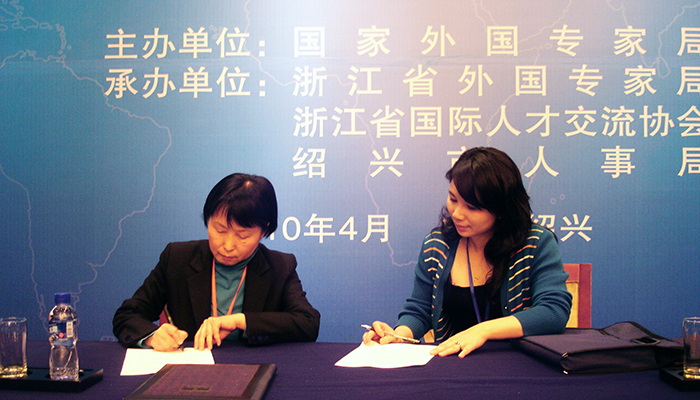 Photo courtesy of Office of China Affairs. UMD's expert faculty and resources make it an invaluable center for continuing education and training for professionals around the globe. The Office of China Affairs (OCA) is a comprehensive training institute exclusively for Chinese professionals in the United States, which seeks to promote stable U.S.-China relations. Through lectures, case studies, simulations, and visits to government agencies and private organizations, Chinese leaders study the interaction of various institutions in order to promote pubic welfare. The Office of Innovation and Partnerships (I&P) focuses on developing local, regional, and international partnerships that promote professional education, innovation, and research. It also supports the adoption of new technologies that encourage and sustain the expansion of entrepreneurial programs and enhance effective teaching and learning. The Office of International and Executive Programs promotes, assists, and coordinates domestic and international activities for the College. Programs include international and domestic master’s degree programs. The International Communication and Negotiation Simulation Project (ICONS) creates simulations and scenario-driven exercises to advance participants' understanding of complex problems and strengthen their ability to make decisions, navigate crises, think strategically, and negotiate collaboratively. ICONS simulations are used by faculty, researchers, professional trainers, and policy planners, domestically and abroad. The ICONS Project has been designing and delivering simulations for more than 30 years, as part of the Center for International Development and Conflict Management, an interdisciplinary research center that seeks to prevent and transform conflict, to understand the interplay between conflict and development, and to help societies create sustainable futures for themselves. The National Consortium for the Study of Terrorism and Responses to Terrorism (START) aims to use state-of-the-art theories, methods, and data from the social and behavioral sciences to better understand the human causes and consequences of terrorism. With this information, START hopes to improve the understanding of the origins, dynamics, and social and psychological impacts of terrorism. The Office of Executive Programs and Education aims to enhance the performance of individuals and organizations serving the public through a wide range of leadership development and public policy analysis programs throughout the U.S. and abroad. Programs are designed to educate officials of state, local, and foreign governments to be more effective and transparent in an increasingly interconnected world and to adapt to pressure for a more responsive government. The Smith School's convening power and connections in Washington, DC and on the U.S. Eastern seaboard allow us to meet the learning needs of a wide range of global executives. Smith also offers an English language EMBA in Beijing, China and an online MBA, which welcomes students from all over the world. The Smith School's Center for Global Business offers an intensive 2-day bootcamp in Export Management designed to equip industry professionals with a solid foundation in global strategy, resources in export management, market analysis, and tangible tools on how to move goods on the market for international export the right way. Participants will personally interact with export-related agency representatives who know how to get products into international markets. International Programs in Agriculture and Natural Resources (IPAN) seeks to promote and facilitate international activities in the field of agriculture and natural resources through training and collaboration with educational institutions, organizations, and agencies throughout the world. Projects aim to help train colleagues in other countries in ways to improve their crop production, animal rearing, conservation practices, and policy understanding through collaborative sharing of experience and information. The Center for Food Safety and Security Systems (CFS3) uses the university’s extensive research, education, and outreach capabilities in order to make meaningful improvements in food protection regionally, nationally, and globally. CFS3 combines the expertise, capabilities, and experiences of academia, industry, and government to work cooperatively with each, allowing for access to an array of scientific partners in the area. The Joint Institute for Food Safety and Applied Nutrition (JIFSAN) is the foundation of public and private partnerships that provide the scientific basis for ensuring a safe, wholesome food supply as well as provide the infrastructure for contributions to national food safety programs and international food standards. The Institute seeks to create sound partnerships to increase the quantity and quality of research to promote food safety, human nutrition, and animal health and production. The Maryland Technology Enterprise Institute (Mtech) is a training center which focuses on technology entrepreneurship. Mtech offers programs, courses, workshops, and competitions to help aspiring entrepreneurs learn how to bring their ideas and products to the world. The Maryland International Incubator (MI2) is a constituent program of Mtech, which is a collaboration between UMD and the Maryland Department of Business and Economic Development (DBED). The mission of the International Incubator is to connect Maryland and International companies for successful joint ventures through an array of business services state-of-the-art facilities and world-class resources.